We may never get another Super Bowl match up like the one we'll get Sunday. 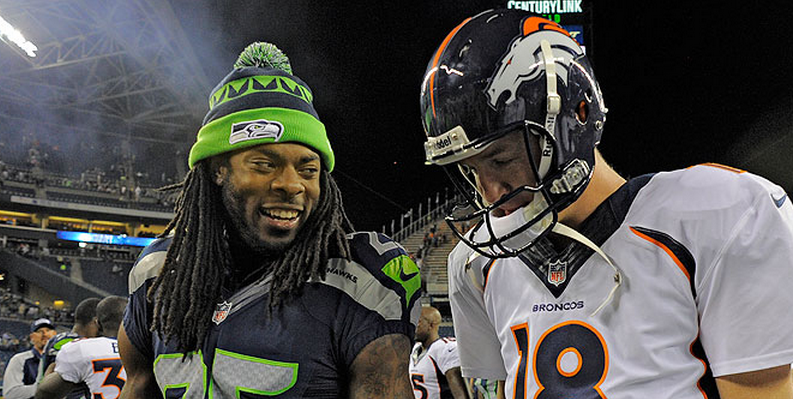 A great deal of history will be on the line this Sunday when the Broncos and Seahawks face off in Super Bowl XLVIII. Peyton Manning will be going for his second title, and hoping to cap the greatest season a quarterback has ever had. The Seahawks will be looking for their first championship ever, and we will get to see a match up of the top seeds from each conference (rarer than you think), and a match up of the league's top defense vs the league's top offense (ever rarer). So, while I wouldn't take any of these facts and run to Vegas with a bag of cash, here's how those match ups have played out throughout Super Bowl history. The top seed from the AFC and the top seed from NFC both making the big game is rarer than you think. In fact, it's happened only once in the past 19 years. That game was Super Bowl XLIV between the Saints and Colts, won by New Orleans, and 20 years ago the top seeded Cowboys wrecked the top seeded Bills 30-13 in Super Bowl XXVIII. In all, a meeting of top seeds has only happened nine times in Super Bowl history, and if you're thinking about using those past meetings to predict Sunday's outcome (I wouldn't), then you will likely be picking Seattle. You see, in the nine Super Bowls featuring both top seeds, the NFC has won seven, with an average margin of victory hovering around 20 points. I mean, Seattle was in the AFC for all but one of those games, but I don't bet on technicalities! Still, on the other hand, Vegas favorites in these games are also 7-2 (and 7-2 against the spread), so you may want to pick the Broncos, who are currently a 2.5-point favorite. On the other, other hand, you definitely don't want to pick the Broncos, because they've already played in two of these games, losing both of them by a combined 62 points. Here are the scores of all past Super Bowls to feature top seeds from both conferences, with the final Vegas line listed next to the winning team's conference. But this isn't just about both teams being the best in their respective conference, this is about each team being better on one side of the ball than anybody in the league. For AFC Champion Denver, it's about Peyton Manning and the record-setting offense. For NFC Champion Seattle, it's all about Richard Sherman and the brash, physical defense. For a quick refresher, both Peyton Manning's 2013 season and Seattle's 2013 defense made our list of "best QB seasons/defenses in NFL history." You can check out the QBs here and the defenses here, if you'd like to see them again. Back to the matter at hand, and again we get to see something rare. You might think the No. 1 scoring defense would face the No. 1 scoring offense in the Super Bowl often, but it has only happened four times in league history, and hasn't happened since 1990 when the Giants (defense) beat the Bills (offense). If you love the old adage that defense wins championships, the numbers (though over an incredibly small sample size) would seem to back you up. Top ranked defenses are 3-1 against top ranked offenses in the Super Bowl, with only San Francisco's win over Denver in Super Bowl XXIV going in the offensive column. It should also be pointed out that the 49ers were no slouches on defense that year, finishing third in the league in points allowed. Here are the four past Super Bowls pitting the top scoring offense against the top scoring defense. On a slightly rarer note, not only did Denver and Seattle lead the league in scoring offense/defense, they were both also tops in total offense/defense (yards gained/allowed). That will make this game only the second meeting between the top total offense and the top total defense. The first being Tampa Bay (defense) defeating Oakland (offense) in Super Bowl XXXVII, 48-21. So, as you might expect, this is the first time in league history we will get to see an offense that led the league in yards and points scored against a defense that led the league in yards and points allowed. And, of course, it is the first time we will get all of those, plus a battle of top seeds. We don't know how exciting Sunday's game will be, or if it will live up to the hype, but you can't argue that the backdrop is set for a classic encounter. We may never see a Super Bowl like this again.